A year ago oil in storage stood at 374.1 million barrels, and with another robust year of domestic production, and despite curtailed imports, the US Oil Inventory stands at 391.4 million barrels and climbing. We might have some year-end selling of US inventories due to tax reasons, especially in Texas, but after all is said and done, if we go by the recent historical barometer of last year where we added roughly 25 million barrels of oil supplies to inventories, this puts supplies around the 416 Million Barrels of Oil level in the heart of the building season. 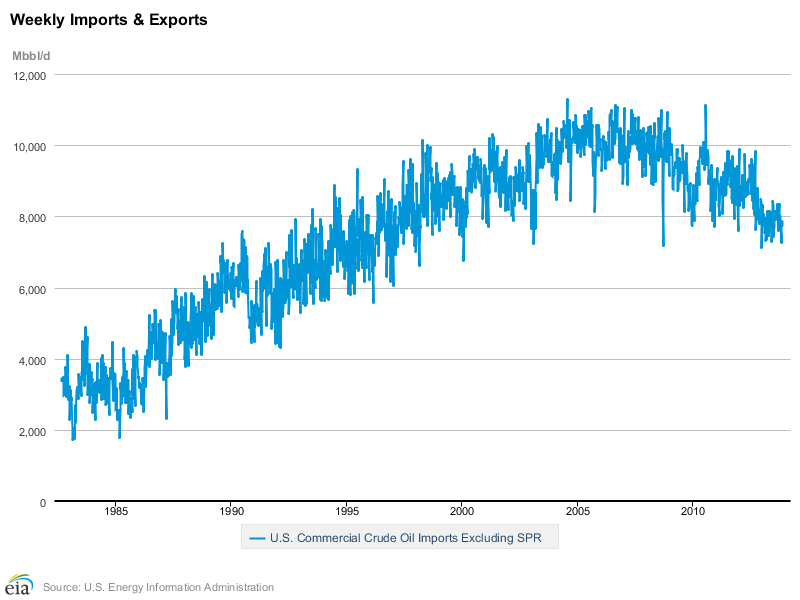 If domestic production continues ahead of pace and imports are not properly managed then maybe 425 Million Barrels in storage is possible, all modern records at this point in the data. What effect this has on Oil prices is an entirely different matter as the Oil market is one of the most manipulated markets in the trading world, just look at the Brent-WTI Spread Trade this year for proof of that, and over the last 4 years for that matter. All markets are pretty bad these days when it comes to market shenanigans, and when the Federal Reserve has basically gotten into the business of artificially created wealth through artificially pushing up asset prices all bets are off when it comes to predicting price adhering to fundamentals in the marketplace. Fundamentals have become irrelevant in most markets these days. But some of us analyst types like to do fundamental analysis just for old time`s sake, who knows it might become a useful tool again sometime in the future once markets lose this unprecedented liquidity injection phenomenon. In looking at Domestic production, the US produces over 8 million barrels per day compared with 6.8 million this time last year, quite a significant jump year on year, and ahead of where my most optimistic forecast was for this metric earlier in the year in March of 2013. This increase in Domestic production is being offset by a reduction in Oil imports with the US importing 7.7 Million barrels per day versus over 8.1 million barrels this time last year. So the goal is to control supplies through managing imports to align with the substantial increases in Domestic production over the last several years, and this trend continues to play out at present. How far this strategy can go before world oil prices start reacting with considerable downward pressure is anybody`s guess but definitely something to keep track of in 2014. But the last several months have had several weeks where Domestic production is more than Imports, and this milestone is quite an achievement for an ‘Outsourcer’ Nation with its core economic strategy of the last 30 years for goods and services. 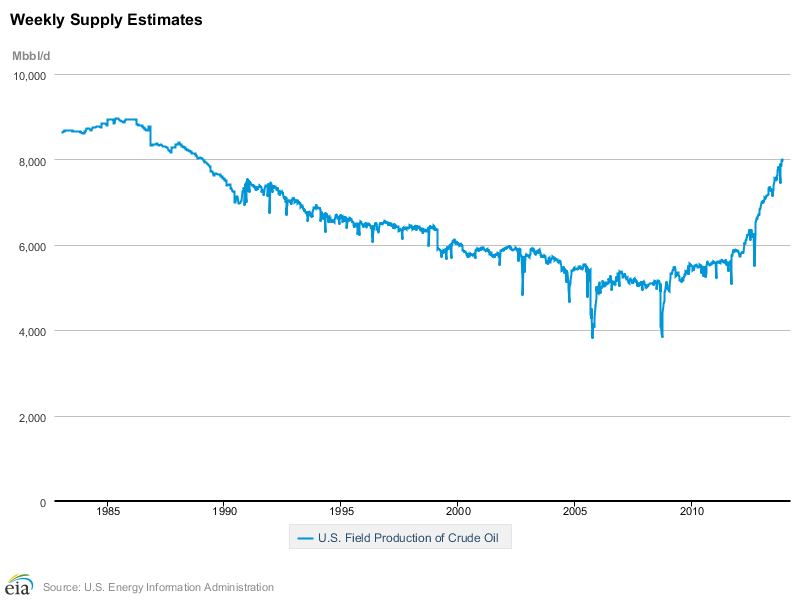 Thus if we go by recent historical trends is the 9 million barrels per day of Domestic Oil production really possible for 2014? 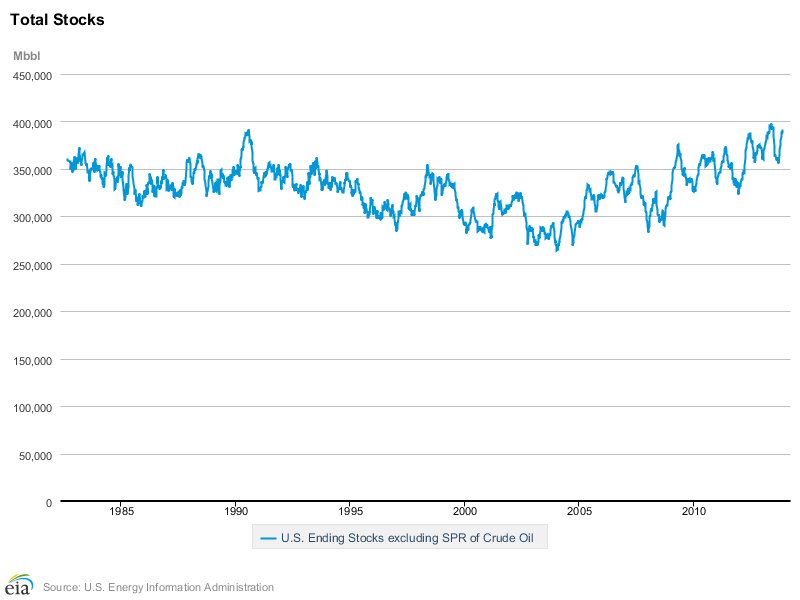 Can the US hit the 9.5 Million Barrel per day mark? And if so what does this mean for Global Oil prices? All these dynamics will be worth watching in 2014, to be sure there are other factors revolving around China, Iran and Venezuela not to mention Saudi Arabia`s strategy in regard to Oil production, but nonetheless 2014 ought to be an interesting one for the Oil Market.